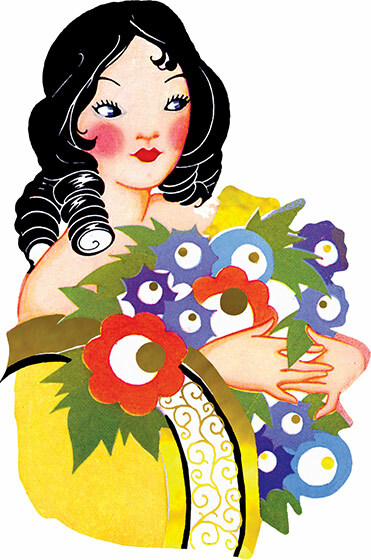 Girlish curls, lots of makeup and and armload of Deco-style flowers.This image comes from a bridge tally. These beautiful cards were created in the1920s and '30s when ladies' bridge parties were all the rage. They were a fancy and decorative way to keep score, and have a souvenir of a entertaining social event. We have reproduced them as they were originally: die-cut and embellished with gold foil. We provide a dark card with a deco pattern which makes an ideal background to frame or otherwise display the image, and decorative envelope so that one of these lovely cards can be shared with a friend.